Thanksgiving weekend signals that the holidays are about to begin in Asheville in earnest. And, there’s a lot to be thankful for in Asheville this year with many great seasonal celebrations already underway and several other celebrations soon to begin! From Christmas at Biltmore to the impressive Winter Lights display at the North Carolina Arboretum, Asheville offers so many ways to get into the holiday spirit. 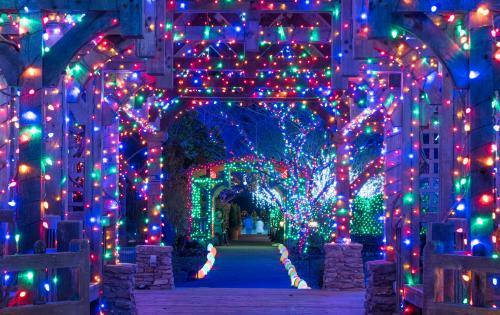 See our guide to 8 ways Asheville sparkles for the holidays! Thanksgiving would not be complete without a great meal! 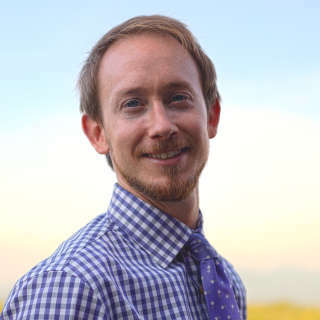 Consider letting an Asheville restaurant do the cooking for you this year! With the help of the Asheville Independent Restaurant Association, we have put together a guide to Asheville restaurants open on Thanksgiving. 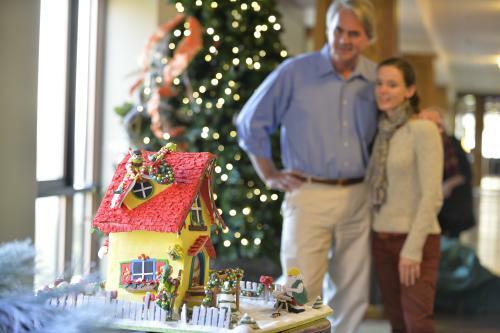 A favorite Asheville holiday tradition, the National Gingerbread House Competition display opens this Sunday at 3 p.m. at The Omni Grove Park Inn. See the incredible gingerbread creations that competed in this year in the National Gingerbread House Competition in Asheville. With the judging over, the entries now line the halls for you to view. Please note there select days/times you can view the entries. See our guide to the National Gingerbread House Competition for information to know before you go. Now through December 31, 6 p.m. to 10 p.m.
One of Asheville’s newest and brightest holiday traditions is illuminating the the North Carolina Arboretum. Winter Lights features more than half a million lights. 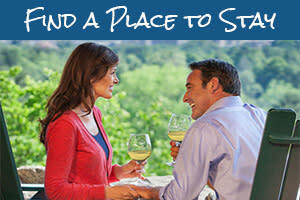 Explore the lights and glowing landscapes of the nationally recognized gardens on your self-guided walking tour. 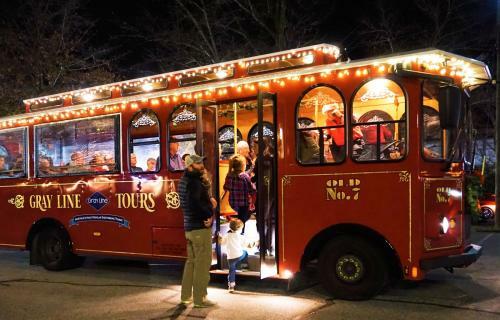 Transportation from downtown and Biltmore Village is available every Thursday through Saturday with a special trolley ticket. 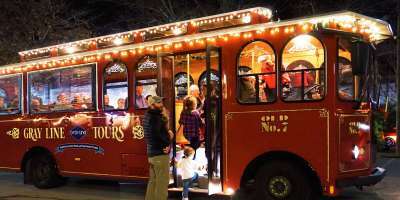 Mondays, Thursdays, Fridays, and Saturdays (Nov. 23 – Dec. 29) 7:00 p.m.
Take a fun and festive tour of Asheville aboard the Gray Line Trolley. Learn stories of Asheville traditions during the holidays and enjoy carolers singing classic Christmas tunes. The trolley is heated and enclosed with vinyl curtains for your comfort. Shop the local, independent shops throughout Asheville for unique treasures for everyone on your shopping list. Asheville&apos;s numerous shopping districts are easy to navigate on foot. The twinkling lights and decorations in these districts, such as Downtown Asheville, Biltmore Village, and Biltmore Park, create the perfect holiday atmosphere. Saturday, Nov. 24, 10 p.m. to 6 p.m.
Purchase a limited-edition glass ornament to decorate your tree. There are only 100 ornaments to choose from so get there early for the most options! This celebration will feature a DJ spinning vintage holiday tunes. Also enjoy glassblowing demos and food and drinks from local restaurants. This event is free to attend. Discover Asheville&apos;s incredible music scene! There are dozens of live music shows this weekend alone. See our live music calendar for a full list that you can search by date! Friday, Nov. 23, 8 p.m. The Emmy-nominated finalist of America’s Got Talent brings her powerful voice to the stage in Black Mountain. Williams, an Asheville local, will sing a soulful mix of jazz, blues, R&B, and more. Offering a mix of jazz and funk, Organ Freeman + The Digs is an LA band traveling the country on its Winter Tour. Known for in-the-pocket grooves, tight-laced musicianship, and unrelenting energy, this band is on the rise. Friday, Nov. 23, 9:30 p.m. Enjoy a night of improv comedy with a troupe on a mission to spread joy, odd noises, and viral goofiness. Tickets are $10 for general admission and $15 for VIP seating in the first three rows. 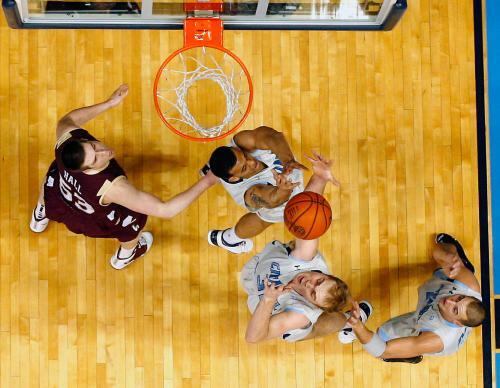 As the NCAA college basketball season gets underway, teams often travel for early season tournaments to prepare for the high-intensity competition of conference play. Four NCAA Division I men’s basketball teams will square off in this round-robin tournament in Asheville at the U.S. Cellular Center. This year’s tournament features UNC Wilmington (Colonial), Eastern Illinois (Ohio Valley), Gardner-Webb (Big South) and Arkansas State (Sun Belt). Tickets are on sale now. Saturday, Nov. 24, 9 a.m. – 1:00 p.m.
Take a guided hike with local naturalist Clint Calhoun who has spent decades learning about the special ecology of Chimney Rock State Park. The hike will cover moderate terrain and pets are not allowed for this particular tour, although they are welcomed at the park. You will need to register for this tour ahead of your visit. Late fall and winter are a great time to explore Asheville area trails -- you&apos;ll find fewer crowds and more expansive views. 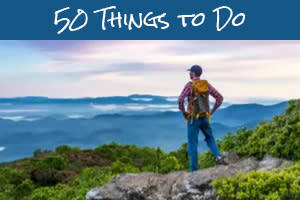 See our guide to our favorite winter hikes in Asheville.